Carly Rothenberg holds a BA in English Literature and a BA in Psychology from Queens College. Today, she serves as the Director of Marketing for Aleph Beta Academy, a new and innovative online center of Jewish learning. The principal educator at Aleph Beta Academy is Rabbi David Forhman, who is an internationally renowned lecturer on Biblical themes. Aleph Beta Academy is committed to the relevance of Jewish learning. We want to help our students struggle with some of life’s biggest questions, and to achieve answers that are meaningful and satisfying. We believe Torah study should be evidence-based, intellectually stimulating, emotionally gripping and relevant to your everyday life. 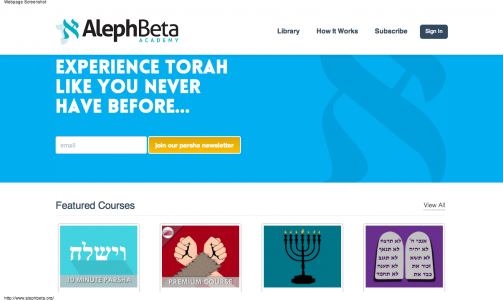 Together with our world-renowned educators, Aleph Beta Academy is building a library of outstanding supplements in Jewish studies inspired by Khan Academy (see this NLE Resources article that discusses Khan Academy). Our material is engaging, exciting, and makes Torah learning deeply relevant and accessible to students around the world. We create video “courses” that have been used in over 50 day schools around the world by over 70 teachers. They are also being used on college campuses and adult ed learning groups. These courses are on average 45 minutes in length and come with fully developed teacher’s guides which helps the teachers and facilitators integrate them into their curriculum. Please feel free to reach out to us as we would be happy to send rabbis and educators an example of our video course and our teachers material. We are certain that your students and congregants will find our courses both educational and entertaining! We also have our 10-minute parsha video lessons which are released every week. These also come with teachers material for easy integration into the classroom. You can see this weeks video here. GUEST POST: The Flipped Beit Midrash GUEST POST: Living with the Times UPDATE: Gemara Academy Melamed Academy: Educate Without Boundaries GUEST POST: The Ani Maamin Foundation Believes…If it’s Broken, Fix it!